The Escapist: Obviously, 4th Edition came under a lot of hate from a lot of people who said you betrayed everything that D&D has ever stood for and are the roleplaying game Antichrist. But anyone can go and read your blog and it's pretty clear you love D&D. You eat, breathe, sleep D&D - you're familiar with everything classic that was ever created and that comes through while talking to you. If you had the assembled masses of people who thought you betrayed D&D standing before you, what would you say to them to explain what's going on, why was this done, why was it necessary, why was it a good thing? Mike Mearls: As far as 4th? The Escapist: As far as 4th, Essentials, the whole design philosophy you're bringing in. What's the method behind it all? Mike Mearls: The key is that when you look back at how D&D has gone forward; no one at Wizards ever woke up one day and said "Let's get rid of all our fans and replace them," that was never the intent. With 4th Edition, there were good intentions. The game is very solid, there are a lot of people who play it and enjoy it, but you do get those people that say "hey, this feels like an MMO, this feels like a board game." Even if you're unhappy with 4th Edition, I say take a look at Essentials and see where we're moving because one thing - I think you can accuse us of gutting D&D and doing all this stuff to it, that's fine - but one thing you can't accuse us of is: we listen. It is one thing that we definitely do in R&D - like you mentioned Justin Alexander's blog - I read that blog. I read those messages and I read those threads. I go to sites where people are crucifying me on the internet, and I'm not logged in, people don't know I'm there, and I still read all those posts. I think that's something that we, as an R&D department, are very cognizant of. We are D&D fans. 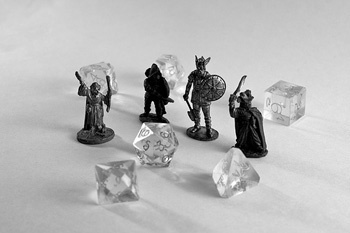 We want D&D to be the best roleplaying game it can be. We're always open to change, to reacting to what people say. The past is in the past, there's nothing we can say or do. If you are a disgruntled D&D fan, there's nothing I can say to you that undoes whatever happened 2 years ago or a year ago that made you disgruntled - but what I can do, what's within my power is going forward, I can make products, I can design game material, I can listen to what you're saying, and I can do what I can do with design to make you happy again. To get back to that core of what makes D&D D&D, what made people fall in love with it the first time, whether it was the Red Box in 83, the original three booklets back in 74 or 75 or even 3rd edition in 2004. Whenever that happened, to get back to what drew you into D&D in the first place and give that back to you. The Escapist: Can we talk a little bit about the changes you are making to items? I understand that there's a new supplement coming out that's going to make items a bit more old school. Mike Mearls: One of the concepts we had originally in 4th Edition - it really carried over from 3rd - was this idea that players can buy any magic item in the game - short of artifacts. If it had a gold piece value attached to it, you could buy it. The Escapist: Which was a horrible idea, by the way, and I eliminated that from my 3.5 campaign.